A beautiful building with a long history and unique architecture. The Dominicans—known as Jacobins in French because their convent in Paris was affiliated with the church of St-Jacques—have a long history in Toulouse. The first monastery was founded in the 13th century. The convent was begun in the 13th century and enlarged over the centuries. It includes a cloister, chapter house, sacristy, refectory, and Chapel of St Antonin. It is no longer used as a church, and the refectory sometimes hosts art exhibits. Although the building is very large and somewhat austere from the outside, the interior is airy and light. It is best known for its "palm tree" columns. Some of these have mirrors at the base so you can admire the top without having to bend back too far. It also has beautiful stained glass, 14th century murals, and lovely painted walls. Above, "Palm tree" ribbing tops the columns. 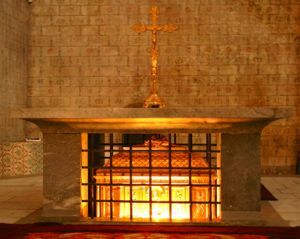 The convent is also home to the relics of St Thomas Aquinas (1225 - 1274), a much revered Dominican. 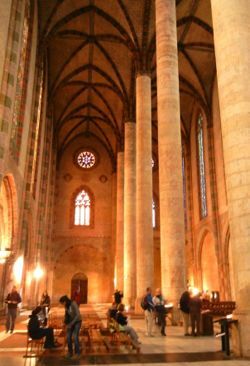 His relics resided at the Basilica of St-Sernin from 1366 until 1974, when they were moved to the Jacobin Convent. Each year on January 28, his feast day, a service is held honoring the saint, an important figure to many Toulouse residents. 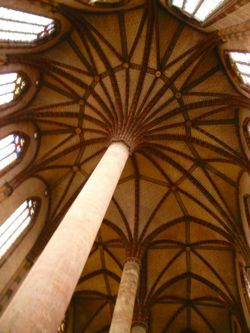 Like many Toulouse churches and religious buildings, the convent is built of local red brick. Given its size, that's a lot of red brick! Above, Visitors in the main part of the Jacobin Convent, admiring the columns and stained glass. Below, Relics of St Thomas Aquinas, Jacobin Convent.